Cleaning and hygiene are fundamental for the catering and hospitality industry. Jangro CEO, Joanne Gilliard, explores the multi-benefits of ensuring a positive washroom experience and how, with proper planning and innovative technology, businesses can achieve best results. In an age of social media, where negative comments can quickly tarnish a reputation, it has never been more important for bars, restaurants and hotels to make, and keep, a good impression amongst its clientele. Of course, swish furnishings, quality food and drink and attentive staff all play their part, but one of the most understated indicators of an establishment’s image is its washroom. Arguably the least glamorous of all spaces, the health and hygiene of a washroom is often perceived as an accurate reflection of the overall establishment, and can influence a customer’s decision to return or recommend. It therefore pays dividends to invest in the washroom experience, not only to keep customers safe, but to protect its reputation, and therefore boost its bottom line. At the most basic level, all washrooms should offer the same requirements: be clean, and supply a working lavatory, toilet tissue, soap, water and a hand drying system. However, for businesses in the catering and hospitality sector, additional attention should be paid to enhancing the guest experience. Establishments should strive to leave their visitors with the ‘wow’ factor. Choosing stylish, innovative and sustainable equipment and supplies is an important first step to achieve this, but maintaining it requires careful planning. So just how do you create an appealing washroom? Firstly, think about the design and layout from the users’ perspective. This is even more important when the washroom in question is limited in terms of size. Consider how people will move around the space and where equipment might fit most appropriately. You want people to flow through easily without having to squeeze back past each other several times to reach dispensers, dryers or the exit for instance. Cramped and congested conditions do not make for a positive experience. However, with so many innovative options available these days, a small room can still make a big impression. technology can also play a significant role in improving perceptions of smaller washrooms. Touch-free soap dispensers, for example, release just the right amount of product every time – this not only enhances the washroom’s appearance, thanks to less mess and wastage, but is also improves the ease of which people are able to move through it. At Jangro, we supply a variety of options and can offer advice on which would be best for your situation. When you also consider that these washrooms are prime hotspots for germs and bacteria, it is clear that hygiene and cleanliness are vitally important, not only in the upkeep of an establishment’s image, but also for preventing the spread of infection. Planning is essential. 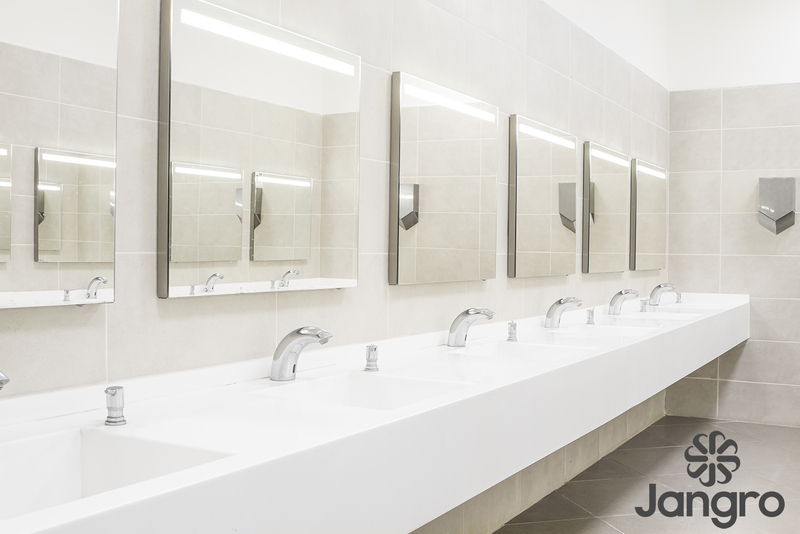 There are many tasks that need to be scheduled to keep washrooms hygienically clean and healthy spaces. Some jobs need performing every day, whilst others on a weekly, monthly or quarterly basis. Innovative technology, once again, has a role to play in helping businesses plan, from helping select the right products, to staying compliant with health and safety regulations. Jangro has recently launched its first ever Virtual Reality platform. This ground-breaking digital tool allows customers to view rooms including the washroom, kitchen, office, and a bar and restaurant area. The VR technology enables them to see what products are needed and how to clean that particular area, whilst linking all relevant digital resources, such as product user guides, COSHH risk assessments, safety data sheets, and Jangro’s award winning e-learning platform, the Learning Management Solution (LMS). Highly accessible and versatile, Jangro’s LMS is free to all of its customers, and their staff. To achieve and maintain a welcoming washroom, businesses must ensure that it is clean, functional, and innovative – and importantly, has visual appeal. This will not only keep customers safe, but will enhance their overall experience, ultimately resulting in commercial benefits.